AirSpace explores the theme of identity via the metaphor of endurance flight, conflating the transcendent myth of ‘the skies’ and the abstract regulatory legalism of ‘airspace’ as defined by Control Zones – ATZs, ASRs,TMAs etc—the piece seeks to narrate dilemmas of fixing, orienting and locating geographical and spiritual self. 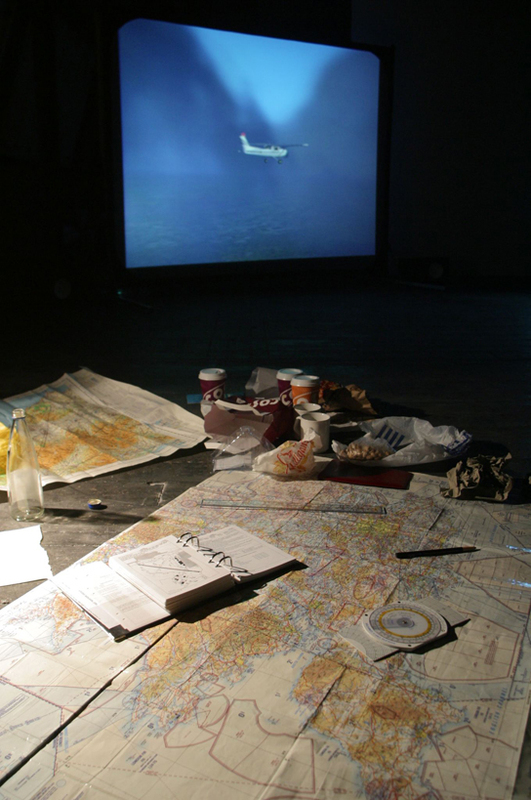 AirSpace enacts the navigational practices associated with solo flight, draws on historical and biographical accounts and uses simulation, live action, video projection, composed music and soundscapes gathered from below the various flightpaths. En-route, the ‘airspace’ of the piece itself—the gallery, theatre, site etc.—undergoes an accretive transformation as the disposable ephemera of global tourism —burger cartons, plastic cups etc.— pile up, along with the collected artefacts of cultural specificity.